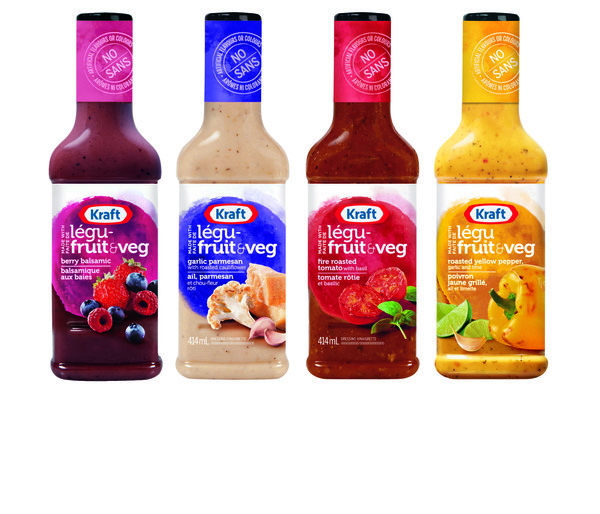 Just In Time For Spring: #NewPourables from Kraft! I'm a huge fan of Kraft Dressings. I buy them for my family to enjoy not only because they taste delicious, but also because they are affordable as well. The best part is, is that I can use them not only on salads, but also on many different other recipes and they taste delicious. 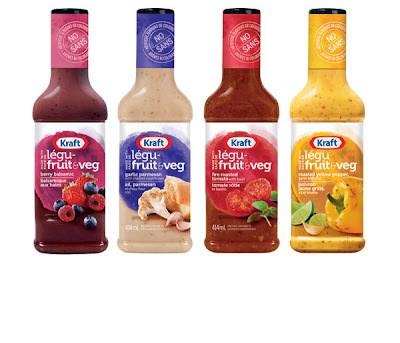 Recently I was sent four new types of dressings from Kraft to try. The new line of dressings from Kraft is called, Pourables and are made with real fruit and veggies. The four different types of dressing my family and I got to try were Roasted Yellow Peppers Garlic and Lime, Berry Balsamic, Garlic Parmesan with Roasted Cauliflower and Fire Roasted Tomato with Basil. These bold, fresh tasting new dressings were absolutely delicious and I was super happy that I had the opportunity to try them. What I loved most about all four dressings were that they all had no artificial flavors or colors in them and that they are low in fat and salt. Each serving is no more than 30 calories, which is awesome to know because this means you can have something that taste so delicious and not have to worry about it adding on pounds, which is great in my book. Out of the four dressings I have to say my favorites had to be the Roasted Yellow Peppers with Garlic and Lime and Berry Balsamic. I enjoyed the other two flavors as well, but these are the ones that stood out to me. With the Roasted Yellow Peppers with Garlic and Lime I tried something different and made a stir fry dish with chicken, rice and veggies and it came out so good. My husband was raving about it. The garlic and lime in this dressing brought such a great taste to the veggies in this dish, it's become a new favorite dish in our home. With the Berry Balsamic dressing I put together two of my favorite berries, Strawberries and Blackberries, added some romaine lettuce along with some spinach leafs and had myself a delicious salad that went together perfectly with the Berry Balsamic dressing. I made it for myself for lunch last week and couldn't stop eating it. All four dressings have been a hit in our home and I'm looking forward to not only finding and trying new recipes to go along with them, but also look forward to sharing them with friends and family as well. They are definitely coming out just in time as Spring is now here and the weather is starting to warm up a bit. So which of these new dressings would you like to try?! Disclosure: All opinions are my own. The products mentioned above have been given as part of a sponsored post through our ad network, SheBlogsMedia, for Kraft Canada.